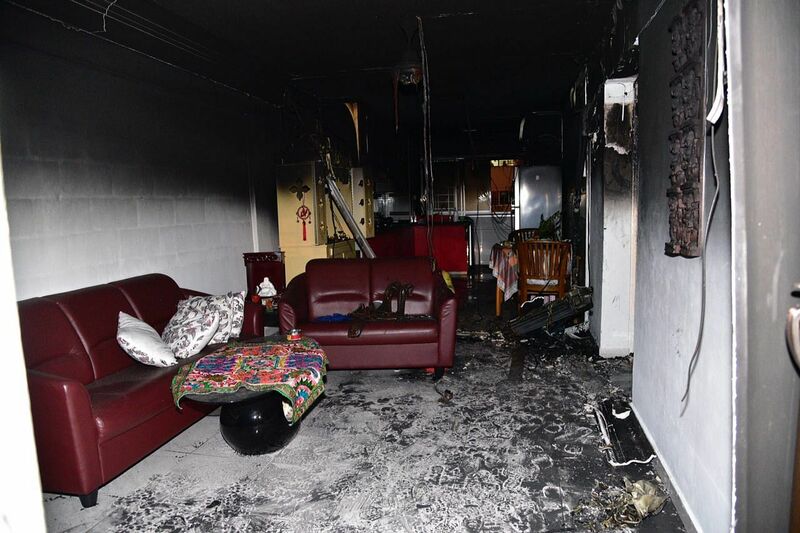 SINGAPORE - More than 60 residents were evacuated after a fire broke out in a second-floor unit at Block 147 Serangoon North Avenue 1 at around 7.10pm on Thursday (Jan 18). Two women - who were in a neighbouring unit and later complained of breathlessness - were taken to hospital. Mr Kenddrick Chan, 26, an undergraduate, saw the fire start at about 7.10pm from his 11th-storey unit at neighbouring Block 146. He said there was a "strong smell of burning rubber as white smoke quickly turned to grey and engulfed the second floor and above". Mr Chan shouted at onlookers in the units above to close their windows. He then heard a loud "pop" sound as the whole block went dark. "They seemed to be in a daze. A crowd below was taking pictures, but those in the block were just staring and pointing at the fire. So I quickly called 995," he said. He also said he saw a man on the second floor, who looked dazed, being led down by firemen using a ladder. Ms Letchimi Subramaniam, 56, a caregiver in a nursing home, said she heard screams at around 7.15pm from her fourth-floor unit at Block 147. She then rushed out and joined a crowd of onlookers at the foot of the block. She said there was a "huge blaze on the second floor". "Flames were coming out of the unit," she said. Ms Andrea Yeo was heading home when she saw two fire engines below the block. “I was quite shocked. I expected to come home to cook dinner but I thought I saw my house on fire,” said the 20-year-old student. Her unit, which she shares with her mother, was right above the affected unit. “When I realised it wasn’t our house, I was relieved but I immediately called my mum to ask her to come home from work,” Ms Yeo said. They were allowed to return to their flat at about 9.40pm. “My furniture and walls are all right. But the house is simply too hot. We have no choice but to head to our relative’s flat in Ang Mo Kio to stay for now,” said Ms Yeo's mother Maria Quek, a 46-year-old retail assistant. The Singapore Civil Defence Force (SCDF) said it was alerted to the fire at about 7.15pm. The contents of a bedroom in the affected unit had been on fire. The fire was extinguished using compressed air foam and one water jet. Firefighters did not have to forcibly enter the flat. 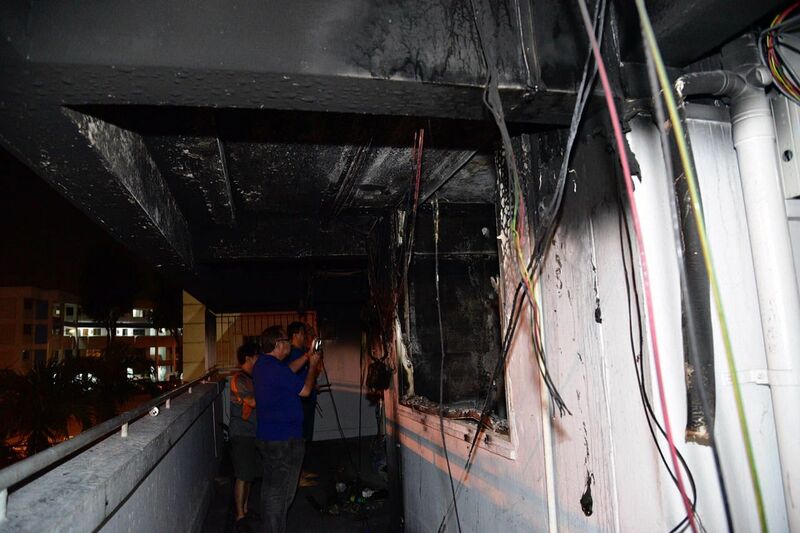 A total of 16 residents from the second to fifth storey - whose units were in close proximity and directly above the affected unit - were evacuated by SCDF and police officers. Another 50 residents left their units on their own. A woman in her 80s and another woman in her 30s were taken by an SCDF ambulance to Tan Tock Seng Hospital because they suffered from breathlessness. 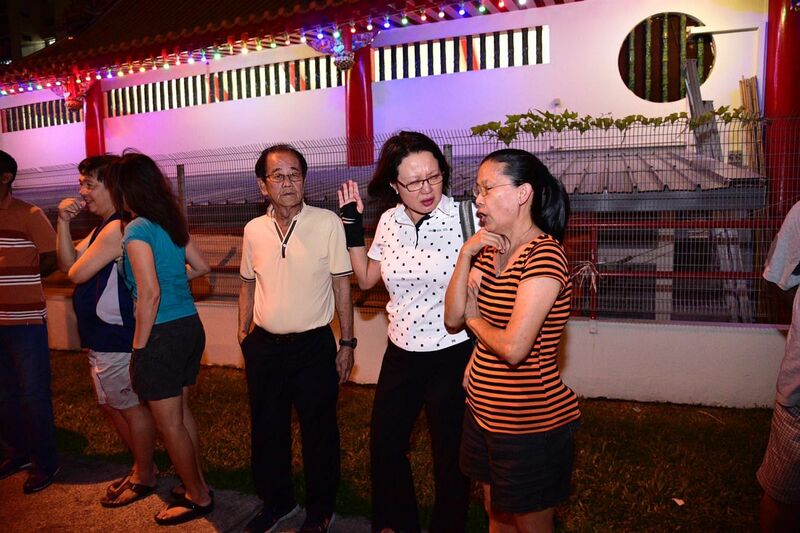 Ms Sylvia Lim, Workers' Party chairman and Aljunied GRC MP, was at the scene at around 9pm. The block is located in her ward. She said: "The incident was an illustration that fire safety can never be taken for granted. Our first priority is the safety of our residents. We are working to restore power in the block as fast as we can."